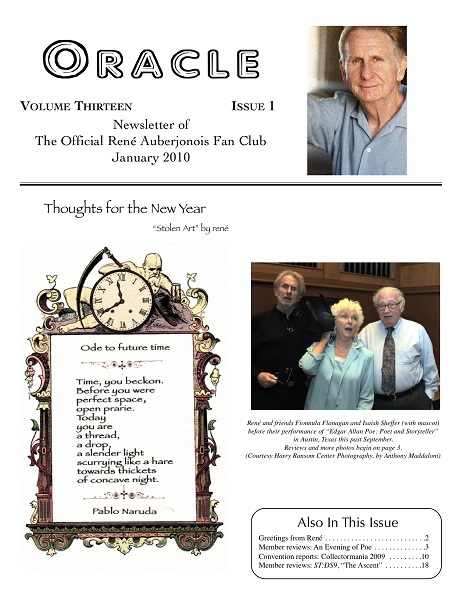 ORACLE is an association of René’s loyal fans, devoted to celebrating René’s talents as an actor and artist and supporting his charity fundraising efforts. Not sure you’d find a fan club interesting? Send for a sample of our newsletter to see if you like it! Only $5 ($6 outside the U.S.) for one back issue. Why wait? JOIN ORACLE NOW!! We also accept dues via PayPal; for further details on that, or other questions about ORACLE, please contact Marguerite. It all started with Lisa Wilcox, an avid Star Trek fan. Lisa decided that she liked and respected not only the work that René Auberjonois was doing on Star Trek: Deep Space Nine but the personality and values that came shining through René’s comments and interviews as he began the new series. She thought that René sounded like an all-around nice guy, in addition to being such a talented performer. So Lisa started to do research. Lots and LOTS of research. She researched René’s stage career. She researched René’s film credits. She researched his television credits. 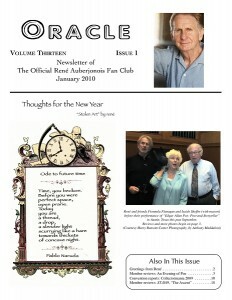 She dug up interviews and articles that no doubt René had forgotten had ever been given or written in the first place. She then put everything into a great big scrapbook and presented her collected research to René with her compliments. Next thing she knew, René invited her to lunch and asked her, “Well, do you want the job?” The “job” under discussion turned out to be heading up a fan club for all of the folks who were showering René with letters and requests for further information. 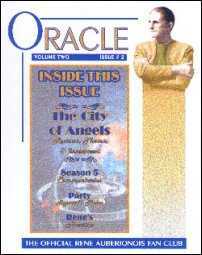 And so ORACLE was born! Want to get involved? 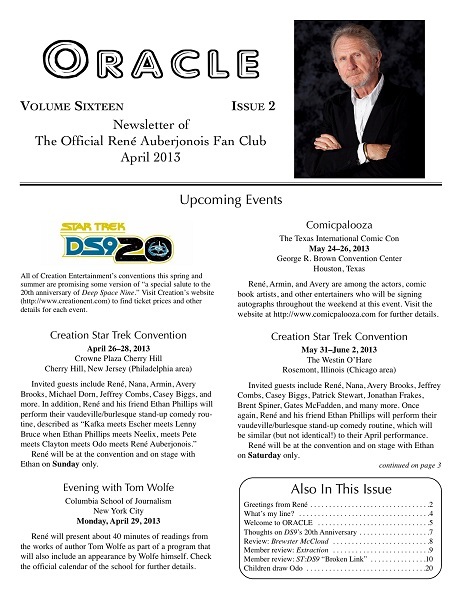 Become a member of ORACLE, an outstanding organization devoted to an outstanding person!